A reclining Buddha is a statue that represents Buddha lying down and is a major iconographic and statuary pattern of Buddhism. It represents the historical Buddha during his last illness, about to enter the parinirvana. He is lying on the right flank, his head resting on a cushion or relying on his right elbow, supporting his head with his hand. This pattern seems to have emerged at the same time as other representations of the Buddha in the Greco-Buddhist art of Gandhara. Buddha awaits his transition from this life to death, viewed as a mere transition into a different state of being. if you're in a transition period, this is a good choice for inside your home or in a garden. 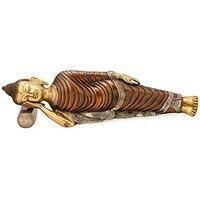 Size : 4 Inches Height X 14 Inches wide X 2 Inches depth, Weight : 2.3 Kg, Material : Bronze. Features:- Made from Quality Brass and Handmade in India.